Motorola Mobility today launches a limited edition Motorola DEFY+ handset which transforms the UK's favourite life proof handset into a 'work proof' model. 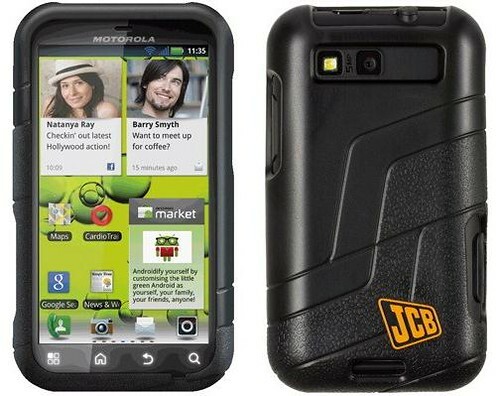 Taking 'work proof' functionality one step further, the Motorola DEFY+ JCB Edition handset also offers construction site users and outdoor enthusiasts who routinely work with core technical and measuring materials a range of built-in options. It comes pre-loaded with bespoke JCB applications including: a spirit level, theodolite, decibel meter and recorder, torch, unit converter, calculator and DIY store locator. This saves the user time and effort of lugging around a boot load of individual work components, and also serves to speed up their productivity and output at the touch of a button. It also features the Android 2.3 (Gingerbread) which delivers a more intuitive user interface and improvements on the features users choose most – including enhanced calendar and email features, home screen options and better battery life.